Porsche LMP1 squad wasn’t the only Weissach team celebrating world championship glory in Bahrain as the GTE Pro-class Porsche Team Manthey squad also wrapped up all three titles at the 2015 FIA World Endurance Championship finale. Like their stablemates’ success in the LMP1 class, Porsche Team Manthey’s victories came after finishing first and fifth in the Six Hours of Bahrain, with the no. 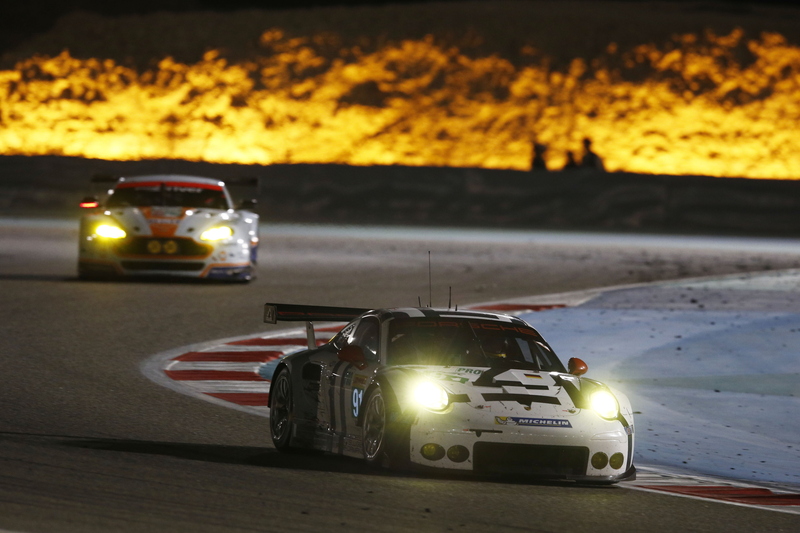 92 Porsche 911 RSR of Patrick Pilet and Frédéric Makowiecki taking the chequered flag first under the Bahrain International Circuit’s floodlights. In qualifying, both 911 RSRs opted to save a set of new tyres, opting instead to focus their efforts solely on Saturday’s six-hour race. This left the no. 92 car to take the start from fifth while the sister no. 91 RSR of Michael Christensen and Richard Lietz (in contention for the teams’ title) qualified seventh. Victory in Bahrain was the first FIA WEC win for Frédéric Makowiecki (left) and Patrick Pilet (right) this season. While Lietz and Christensen (both lacking pace across the weekend compared to the Pilet/Makowiecki car) approached the race cautiously, Pilet went on the hunt during the race’s opening laps. Up to third after lap one, the 2015 Tudor United SportsCar champion had taken the lead by the end of the 11th lap, using the no. 92 Porsche 911 RSR’s superior race pace to fend off repeated attacks throughout the race. Alongside Makowiecki, the duo put in a sterling performance, eventually taking the chequered flag 40 seconds ahead of the chasing AF Corse Ferrari 458 of Gianmaria Bruni and Toni Vilander, a result that secured Lietz in the no. 91 car the 2015 drivers’ title. Richard Lietz and Michael Christensen took it steady in Bahrain to help Porsche secure all three FIA WEC GTE Pro titles. This left the no. 91 RSR of Lietz and Christensen to continue with their sensible race strategy. Having originally planned to up the pace after nightfall, the Austro-Danish duo instead ran steadily to the end, staying out of trouble to finish fifth, a result that mirrored the no. 17 Porsche 919 Hybrid in the LMP1 class. Combined with the points for Pilet and Makowiecki’s victory, Porsche’s points haul at the Six Hours of Bahrain was enough to swing the manufacturers’ standings in their favour, overcoming Ferrari’s five-point advantage to secure the 911 RSR’s second major title in as many months. The result also meant that the no. 91 RSR crew won the 2015 FIA WEC teams’ battle, providing Porsche’s factory GT squads with a clean sweep of title across both the World Championship and the US-based United SportsCar Championship. For all the latest Porsche race reports and news, check out our dedicated motorsport section now. The 2015 FIA World Endurance Championship is Richard Lietz’s biggest success to date.